Theme: God’s faithful and generous people look to the witness of scripture, to the example of Jesus, and to everyday saints of all times and places to teach them what it means to turn and change their lives, hearts, and minds to pursue the path of peace. 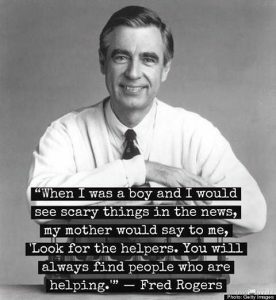 “When I was a boy and I would see scary things in the news, my mother would say to me, ‘Look for the helpers. You will always find people who are helping,’” Fred Rogers once said. This is good advice, as timely today as it was when Mr. Rogers was a child. You see, when we look for the helpers we also find the teachers. We find individuals who teach and model a better way of being and living in this world. This Sunday we light the Candle of Peace on the Advent wreath. We do so perhaps not realizing that some 25 conflicts are happening around the world—from civil war in Syria to tensions in the East China Sea, and from war in Yemen to the destabilization of Mali—according to the Global Conflict Tracker. We light this candle when we may have conflicts in our own home, congregation, or community. In doing so, we defiantly stake our claim and desire for peace in a world that sorely needs more of it. Our lessons today tell of messengers pointing to Jesus, of tongues loosed upon encountering the good news of the incarnation, and of prayers for the faithful to grow in love and faithful discipleship. Perhaps Mr. Rogers mother should also have encouraged us to look not only for the helpers but also for the teachers, for the ones who will point us in the right direction and guide our path. Often the teacher and the helper are one in the same; a person whose life is grounded in deep faith, whose love is made visible in action, and who points to the One who brings mercy, love, and ultimate peace. The prophet in Malachi speaks of a messenger who will come, Luke tells of John the Baptist to whom God’s word came, Zechariah, John’s father, has his tongue loosed upon the birth of his son, whom he names John and prophesies that he will go before the Lord to prepare his way. Finally, Paul offers edification and encouragement to the church at Philippi, commending their love and good works. In order to be good stewards of the gospel—and of our time, talents, and resources—we need to look for the teacher and the helpers. We need to be mentored in the life of faith and discipleship. We find encouragement and help in the faithful witness of saints both past and present. Yes, we must be carefully taught in the way of peace, of lasting life, and boundless love. Find the helpers, seek the teachers, the ones who will help us speak a counter-cultural word and live a life radical in its witness of shalom. Blessings on your Spirit-inspired preaching and teaching! May Christ’s light of peace shine through your words and bright energy. Hang in there; the light is coming. And do take good care of yourself during these full days. Teaching stewardship in Advent provides an opportunity for a counter-cultural message about being aware of how we spend, use, and consume our time, talents, and resources. Our choices matter greatly. Teaching stewardship involves teaching and modeling gratitude. The epistle lesson from Philippians offers a solid platform for preaching and teaching gratitude. Be sure to take a “generosity pause” after the offering to thank the congregation for the work their gifts make possible. Lift up examples of generosity and service if possible, and take the time to say “thank you.” It’s true that an attitude of gratitude leads to greater happiness, a more generous spirit, and deeper discipleship. How can you practice gratitude in worship and encourage members of the beloved community to take that attitude of gratitude back out into the world—particularly in this season of consumption. This week’s lessons invite us to look at messengers, helpers, and teachers. Consider showing a YouTube clip from the Rogers and Hammerstein musical South Pacific where Lieutenant Cable sings “You’ve Got to be Carefully Taught.” This song talks about how fear of the other and racism is taught early in life. 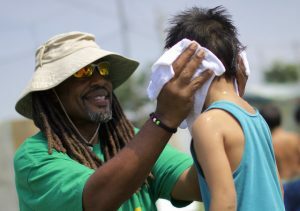 Contrast this teaching with the way of Jesus that John the Baptist paved the way for. Invite youth to talk about those who have modeled inclusivity, empathy, compassion, and love of God and neighbor for them. It’s tough to find your way in the dark! Ask the children if they’ve ever been stuck in the dark and unable to safely find their way to a safe place. We need light to see our way, to avoid tripping and falling. Invite the children to talk about what sort of light is helpful (flashlight, candle, lantern, glow sticks, cell phone, etc.) The arrival of Jesus in the world brought light to those who were stuck in darkness, a light that would guide them along the right path. Today we don’t have Jesus walking around with us as he did with his disciples, but we do have the record of his life and ministry in the pages of scripture—a light to guide us. If we follow Jesus’ teachings, we will be able to stay on a good path the will lead to lasting peace. It’s easy to get side-tracked, so we keep our eyes on Jesus’ light. Give each child a glow stick with the instructions to use when stuck in darkness and finish with a simple prayer. Tell them to keep looking for signs of Jesus’ coming as we move through Advent. We’re not there yet, but we’re getting closer! We don’t become good stewards of the gospel and of our time, talent, and resources overnight or by accident. We need good teachers to guide and model for us. Who are some of the teachers who have helped spark your faith and who have instilled in you a generous spirit? Be sure to tell them thank you! This week’s message has a lot to do with preparing the way, and most of us are in the middle of preparations for Christmas. It may seem like there’s way too much to do and not enough hours in the day. 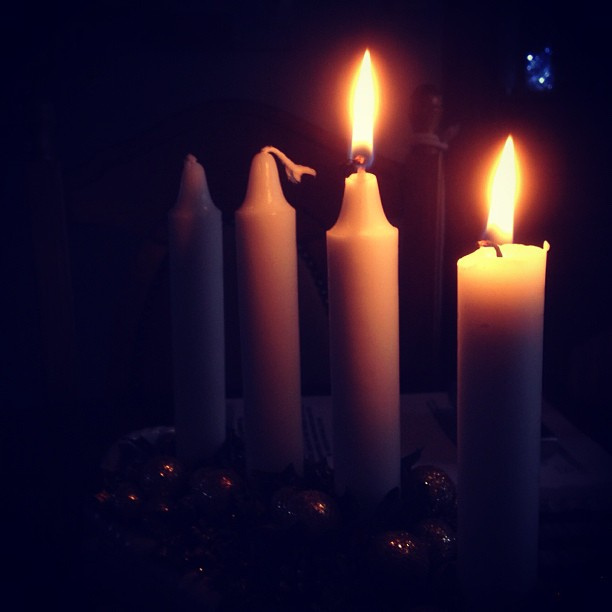 Advent offers us lessons in slowing down and becoming more deliberate in preparing the way for Jesus. Take some time this week to breathe. Look around you and consider what really matters. Who truly needs your time and attention this week? Who would benefit from the gift of your presence? How will taking time to rest and pray make a difference? Set a goal to take at least 15 minutes each day to reflect, pray, and study scripture or read and Advent devotion. It’s good for your spirit, mind, and body! Photos: Susanne Nilsson, Darin McClure, and John Christian Hjellestad, Creative Commons usage license. Thanks!